This book is one on my list of books that have a big impact on me. A book that will change me in some way and will stick to me for life. It reminded me a lot of 1984. It plays with your mind. When you finish it, you have to stare into the nothingness for a while and get your mind together. 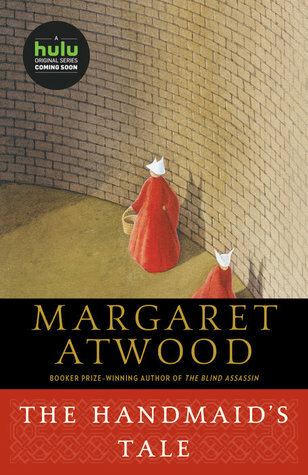 It’s a scary world that Margaret Atwood created. Not the scary that you get from a horror book. A country without freedom. Women being deprived of their rights, not allowed to work and have their own career. Women are put into the households of couples that can’t get children, so the women can do the job for the infertile women. If the handmaids don’t produce, theit future is unsure. I was amazed with this whole concept. Although it’s something that I believe wouldn’t happen so fast today in our society, I believe that there certainly is a possibility for the creation of a society like this. That terrifies me in a way, just like the story of 1984. Happy families are here torn apart to work for the rich and influentia. The characters in the book all gave me a miserable feeling. Everyone seemed unhappy with their lives. The tiny happy things in life didn’t seem to make anyone happy, even the people with a good life. It sets to think if situations like in the book are actually possible in real life. Everyone would feel terrible. Offred feels the force to produce a baby, already coming to an age where it will be more difficult to get pregnant. She has a lonely and sad live, not being able to live any of it, but is treated well so she has a higher chance on getting pregnant. On the other side the people aren’t happy either. Serena Joy has to let her husband do a fertility ritual every month, to try and get Offred pregnant. Serena must feel terrible not being able to get pregnant herself and having to see her husband do it with someone else. I believe that this is a book that you just have to read. Like 1984 it gives you a sense of realisation of the world we now live in. The style of writing is something you have to be in the mood for or have to get into. It’s not a fast-paced book, but a book you need to take the time for to absorb it. I gave this book 5/5 stars. Have you read it? Let me know what you think.